Last year I blogged about my home lab and it has been running stable for more than a year. I never found the need to upgrade from vSphere 5.5 since everything just worked. I wanted to get my home lab upgraded to 6.0 update 2 to stay current but at the same time I thought about my vCenter and shared storage usage. I only have a few VM’s running at home, and to be honest I don’t need shared storage or a vCenter for my usage. I had some 800GB Intel S3700 SSD available and choose to go down the route with local storage. One of the reasons for my usage of vCenter is that I access it from a Mac. I need the web client. After installing the first NUC with a local SSD I tried to login in to the new HTML5 Host Client. What a pleasant surprise. The client is FAST, efficient and works from Chrome on my Mac Book. 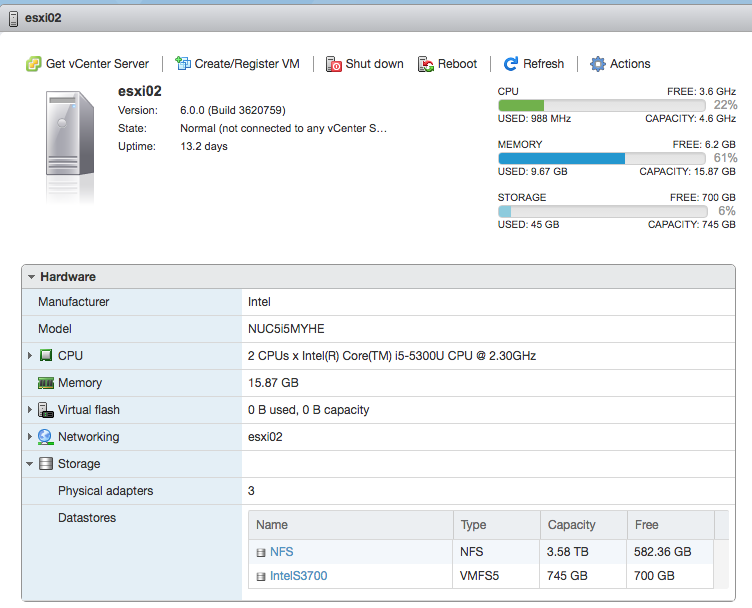 I deployed a few VM’s and even on my small dual-core NUC running on local S3700 SSD the VM’s performed great. I will probably deploy a vCenter Appliance on my second NUC, but for the home lab it is not really needed.